After saving a cruise ship from a bizarre whirlpool Superman settles in for a good night's sleep. Destiny interrupts this declaring that it is time and Superman's fate must be decided today. At first the Man of Steel tries to go back to sleep but Destiny isn't having any of that. Destiny informs Superman that he must decide between two evils; one that leads to destruction and the other that leads to despair. Superman is suddenly in Metropolis where he is faced with a giant named The Dread who is busy laying the city to waste. The Dread blames the destruction on Superman as the Man of Steel has thwarted his other attempts to destroy the world. When Superman fights back the Dread gives him a choice; serve as his solider allowing the people of the Earth to live albeit as mindless, obedient slaves or fight and the world dies. Destiny freezes time and shows Superman images of what the world would be like if he fought back including Batman being broken, Hal Jordan going insane and Superman dying at the hands of a rampaging monster. Destiny even reveals that Supergirl would die as well. Superman refuses to believe those are the only two options and swears that he will fight for the people of Earth as long as he can. He also figures out that the Destiny he has been speaking with is not the Destiny he encountered before. Destiny believes that they have made the right choice and returns Superman to his apartment. Superman thinks that it was all just a dream. "Destiny", actually Harbinger in disguise, returns to the Monitor's satellite and they discuss Superman's actions and how the Dread may or may not exist someday. Meanwhile Superman calls his cousin to tell her about his dream and that she should be careful. Kara is confident that there isn't much that can hurt her and notes that there probably won't be any rampages today because a bad storm is moving in complete with red skies. Story - 4: My first reaction to this story was, "Oh! So that's why Bane and Superboy Prime and Parallax are on the cover. It makes so much sense now." Seriously. I haven't had a cover fool me like that in some time. It really confused me. After reading this story I realized how easy it would be for a writer to screw up this sort of thing. This story could only have been written in the here and now and knowing what has happened in the DC Universe for the last two, almost three decades. What makes this particular story stand above the crowd is the fact that Wolfman uses it to make a definite point about Superman. It is all well and good to have Superman see future events like Amazons Attack, Knightfall, No Man's Land, Identity Crisis, Wonder Woman killing Maxwell Lord, Emerald Twilight, Doomsday, the end of the New Krypton Saga, Blackest Night and the death of Supergirl but you need something more to make it a good story otherwise it is a glorified clip show of a comic. It was the final scene that really made this story "come alive" for me. It was fun (if that is the right word to use) to see the Pre-Crisis Superman see the future but the theme of this story is that no matter what Superman will never give up and I love that. The whole conversation between Superman and the supposed Destiny was fantastic. To me Superman is the type of character that when given two impossible choices will always find the solution. To him there is always another way. The line about him choosing not to kill gave me a little pause because one of my favorite Superman storylines ever stemmed from him killing the Phantom Zone villains but it still worked for me. It implies that this take on Superman sees killing as something that could happen and given his powers would be easy to do but it is the line he doesn't cross. It makes Superman more human to me that he would acknowledge that. Overall this was a solid and engaging story. The only weakness that I could see is that it didn't exactly reflect the Superman of that era. We saw Supergirl for a couple of panels and it was definitely tied to CRISIS ON INFINITE EARTHS (which was extremely cool) but in all honesty the story could have taken place in the seventies, eighties, nineties or in the last ten years and still have been as effective. The themes explored are universal to Superman as well. It doesn't take away any of my enjoyment of the story but I thought it was worth mentioning because, well, I am writing a review and that's sort of what reviewers are supposed to do. More than anything it was cool to see Marv Wolfman write Superman again. That alone was worth the cover price of admission. Art - 4: Sergio Cariello's art in this story was fantastic. His Superman is buff but not overly so. The art in this story reminded me of Jose Luis Garcia Lopez actually in all the right ways. The action scenes were solid and I liked the art choices when it came to showing the major events of the Post Crisis DCU. My favorite moment artistically came towards the end of the story when Superman figures out that the Destiny he has been talking to is not the Destiny he met before, which he actually should have been tipped off to earlier since in their first encounter Destiny tells him that he only appears once before a person. Anyway, the expression on Superman's face is perfect. He has this slight smirk and his eyebrows are crinkled and the whole image says, "I've got your number, whoever you are." A great moment is a great story and the art is what sold it. Superman rescues several people from a tenement fire. Afterwards he saves a small boy from being held hostage. The next day he meets Lois Lane for their date and after testifying at a trial they finally have dinner. A priest named Father Perez interrupts their meal and asks Superman if he can help remodel the building he saved the previous day which has been given to the Hispanic Children's Aid Society. Superman says yes and then talks with Lois about the fact that everyone has come to depend on Superman. Superman has to leave early to take care of an emergency and when he returns to Clark Kent's apartment he is confronted by Destiny. Destiny explains that he appears before each man only once at the moment when fate may be altered and that Superman must heed the words he now implants within his mind adding that he must obey them or the fate of all those about him will suffer. The following day Superman announces that he is retiring. A crime wave grips Metropolis in the wake of Superman's announcement. Superman tries to help the police but is stopped by Destiny. Meanwhile Father Perez begins the renovations without Superman and Lois covers the story. The building's owners threaten Perez that he better stop or else but Perez refuses to give in. Thanks to Destiny Superman cannot act when the landlords return to destroy the building and kill Father Perez and the orphans. It turns out that Superman's help wasn't needed at all as Perez and Lois take care of the crooked landlords. In the end Superman learns that he must let humanity take care of some of its own problems. Story - 5: In SUPERMAN (Vol. 1) #247 the Guardians of the Universe use a heaping, helping dose of non-subtle hint dropping that maybe...just maybe Superman is bad for the social development of humanity. We follow Superman through the course of the story as he wrestles with the philosophical implications of his presence on Earth and wondering if he does too much for the human race. I can write with confidence that this story is a classic because it has been reprinted in a bunch of trade paperback collections including THE GREATEST SUPERMAN STORIES EVER TOLD, SUPERMAN IN THE SEVENTIES, SUPERMAN: THE GREATEST STORIES EVER TOLD VOL. 1 and GREEN LANTERN: IN BRIGHTEST DAY. When a story appears in not one but two trades with "GREATEST STORIES EVER TOLD" in the title it is safe to say that people in power think highly of this tale. I have never liked it. I think that story was extremely heavy handed and if you are going to choose a race of beings to tell Superman that he does too much and might be holding humanity back somehow the immortal beings that formed their own interstellar police force and armed their officers with the most powerful weapon in the universe to go off and do pretty much what Superman does on a daily basis seem like a bad choice. Actually it makes the Guardians look like a bunch of hypocrites. This is nothing against the writer of that story. I just didn't care for it. "Superman's Day of Destiny" has the same premise as "Must There Be a Superman" but handles the idea in a better, more satisfying manner. The idea of questioning Superman's place in the world and wondering if people depend on him too much is a sound one. Like most stories it is hardly ever the idea that I dislike, just the execution. Wolfman takes the ball and runs with it from the first page and I ended up thoroughly enjoying this story. Using Destiny as the instrument of change in this story works so much better for me because Destiny is an enigmatic character that isn't in the same line of work as Superman is. There is a part of me that felt that the story was a tad on the clich�d side but in the end it works. The one element of this story that I found almost laughable was the fact that Superman retires in the middle of the story and then comes back at the end to say, "I'm back." The fact that no one turned to him to say, "Really? After Metropolis tears itself apart in the biggest crime wave this town has ever seen? Now you come back? You're kind of a jerk, Superman," kind of surprises me but then again I am snarky and cynical at times so maybe I am the only one that had that reaction to Superman retiring. In all seriousness Superman saying, "I'm done," is a pretty big deal and here it is treated like just your average plot element. There was one scene that really stood out for me. After the city starts to self-immolate over Superman's retirement Lois, Clark and Jimmy talk about it back in the office. Lois suggests that they might be better off without Superman (after reminding us that she loves him) and Clark leaves saying the air in the room is starting to bother him which is Clark Kent speak for, "You're being a jerk." Lois starts to dog on Clark saying that is he not only insufferable but that if you say, "Boo," to him and he runs for cover. Jimmy steps up and says, "And you've been all too anxious to say it to him haven't you, Lois?" This is treated as sort of a throwaway line but it really made me laugh because Jimmy essentially told Lois to shut up and stop being such a shrew. That, to me, is cool. Art - 4: As I mentioned in the last Retroactive review I rather like Swan's artwork and have grown to appreciate it more as I have gotten older. The one stand out scene artistically in this issue was when Clark comes face to face with Destiny for the first time in his apartment. It is extremely moody and sold the other worldly nature of Destiny as a character. Other than that I would consider this a fairly standard Curt Swan drawn Superman story. Not the best but definitely not the worst. Cover Art - 5: I'm going to give this cover a five because I think it is a great piece of art and reminds me of a bunch of stuff that I liked about DC in the '90s. 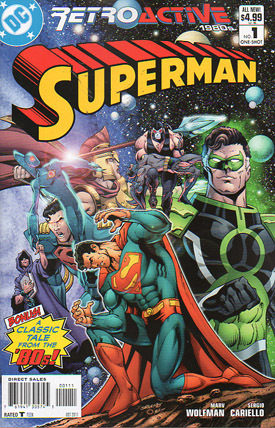 There is a small part of me, however, that wants to call foul on this cover because...well...it says "1980's" right there at the top but Superboy Prime, an OMAC, Bane playing Snappy Spine with Batman and Parallax fill the rest of the image. Reading the story shed the light on this cover...doesn't mean it wasn't misleading. To be fair...Superman looks pretty awesome.